Pilar (trichilemmal) cysts, sometimes referred to as wens, are common fluid-filled growths (cysts) that form from hair follicles that are most often found on the scalp. The cysts are smooth and mobile, filled with keratin (a protein component found in hair, nails, and skin), and they may or may not be tender. Pilar cysts may run in families. Rarely, these cysts may grow more extensively and form rapidly multiplying (proliferating) pilar tumors (also called proliferating trichilemmal cysts), which are non-cancerous (benign) but may grow aggressively at the cyst site. Very rarely, pilar cysts can become cancerous. Pilar cysts occur in 5–10% of the population. Pilar cysts occur most commonly in middle-aged women. Pilar cysts may run in families. 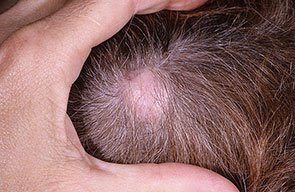 Pilar cysts are usually found on the scalp. They appear as smooth, movable bumps under the skin. There is often more than one in an area, and they may become quite large. Occasionally, they are tender to the touch. The cysts may spontaneously burst open (rupture), usually causing intense redness and irritation. Youch, that looks painful! My husband gets them on his head sometimes, it's the weirdest thing.